What works for me is having a sense of humor! I get my sense of humor from both sides of the family, which makes family gatherings quite pleasant most of the time! I am also blessed to have a husband with a similar sense of humor so we are able to laugh at many situations that would upset others and are often "silly" to each other - lots of laughter is good for the marriage I say! My son has inherited the humor thing as well - some days that's good and some days I am not so sure - LOL! Perfect example tonight - my Dad, sister, hubby, son, and me went to a Chinese buffet restaurant for dinner tonight (and it was quite good!). Because of our sense of humor, we are able to enjoy ourselves anywhere! First, my Dad (who has a long history of embarrassing me and my sister) embarrassed my son! As my son was getting ready to go back up to the buffet for the 3rd time - for dessert of course - my Dad stopped him, telling him that he would have to get permission to go up more than twice. He actually called our waitress over and told her that my son wanted to know if he was allowed to go up a 3rd time! She was very good-natured and laughed and told him he could up as many times as he wanted. You should have seen how RED his cheeks got!! We were all laughing as none of us thought that Dad would actually ask her. "Work on improving your exercise routine." Oh we laughed and laughed!! I decided we should come up with a whole line of rude fortunes. My best suggestion was: "Wow, you really need to unbutton that top button on your pants." Or maybe something like: "I think three trips was too much." And we remembered the e-mail that went around showing a clean plate after a Chinese meal and the fortune that said: "That wasn't chicken." LOL - that makes me laugh every time. Good time, good times. Maybe all this isn't as funny to you as to me, but I hope you find something you can laugh about! Do you and your family have a good sense of humor? 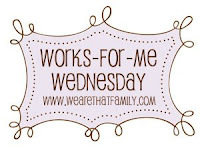 For more Works-For-Me-Wednesday, stop by We Are THAT Family! Okay do I really need to answer the question about MY family having a sense of humor? LOL. I'll give you something to laugh at. If you look at your picture the guy sitting to the right of your son (behind him) looks like a sumo wrestler because of the placement of the waitresses head, it makes it look like one of those bun thing hairdos and the guy looks big. Big Sumo wrestling size hugs to you my friend. Oh and the ice cream cone thing is hilarious! But goes against everything I believe in when it comes to the "perfect" ice cream cone. Because I CAN make "the perfect ice cream cone" LOL Better than Dairy Queen! Hee! Hee! I can't get through life without a sense of humor!! Love the ice cream concoction. Such a fun post, Lisa. 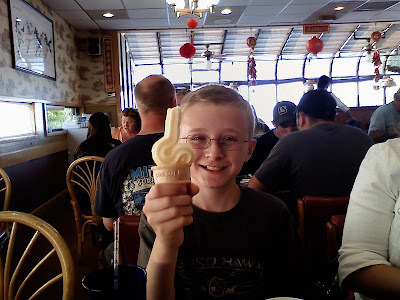 Your son is too cute--gotta love that ice cream cone! Oh that is too funny! We are a fairly serious bunch (how could you ever tell, right ;) But we do laugh a lot. I want my son to have great memories of laughing. Thanks for the reminder of how important that is! Hope your enjoying your trip my friend! Hahaha that cone is awesome.